initiation | QuantumPhoenix.net – Esoterica, Paganism & Ritual Magic. These monthly Wicca & Witchcraft monthly Circles are ideal for YOU – if you have an interest and like to participate in an outdoor Wiccan ritual with like-minded magical people. 2. Walk together to the woods and to the exact ritual spot (this also changes depending on other factors on the day). 6.Back to Cafe/ Pub for warm up and social and chats. 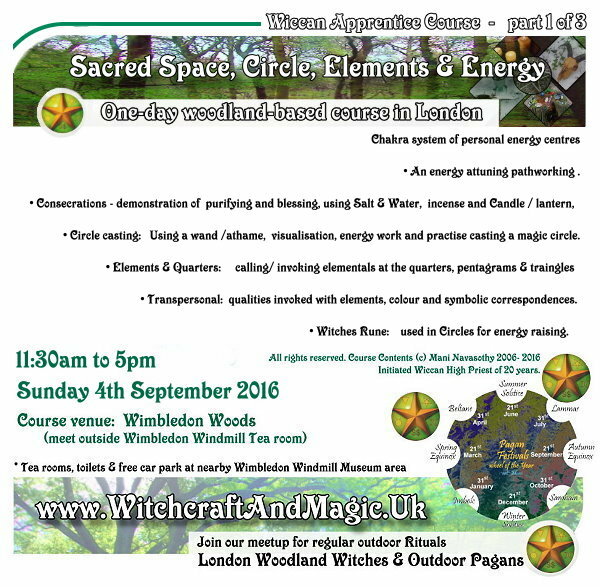 These Wicca Circles are facilitated by Mani Navasothy (Wiccan High Priest with 19 years of Craft & Coven experiences in London). Some times we get assistance from other wiccan friends (initiated, solitary, hereditary etc). Come and join us..! Please wear sensible outdoor (warm, waterproof) cloths, and shoes. Please bring some food & drinks/wine to share at the feast after ritual.. There will be opportunities to talk to Man and ask questions afterwards at social.. Date: Saturday 8th November 2014. Meeting time (at Pub) – 4pm. Meteing Venue: Woodman’s Pub. (This is 3-4 minutes walk from the nearest Tube station.. The Pub is on the main road..on corner of Archway Road & Muswell Hill). Nearest Tube: High Gate (Northern line). 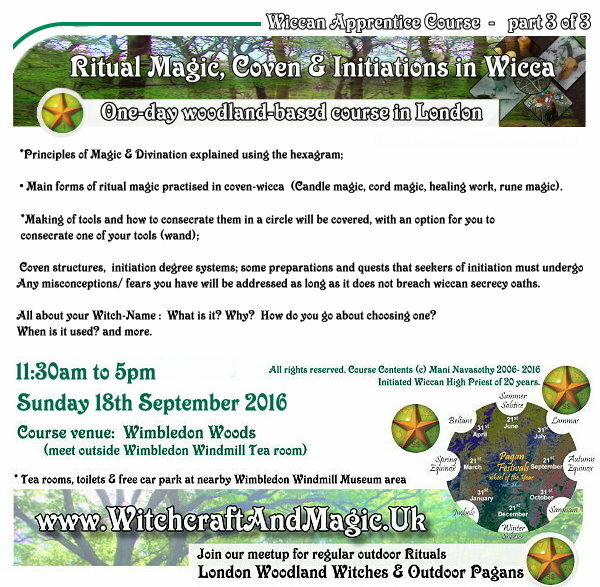 Ritual venue: Queen’s Woods (North London). http://www.WitchcraftAndMagic.org/ You can also join our e-mail list there for exclusive news, updates & more. -No audio/ video recording at any time! -No photos of others without YOU asking them clear permission. -No `observations’ or `note taking’ by research students/ Journalists. -Mani (organiser/ Wiccan) has been in the public eye for over a decade, running many open pagan events – and has given personal & formal interviews etc for BBC, Channel 4, and others. 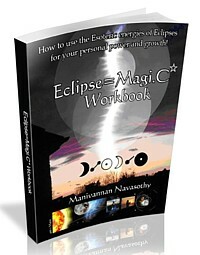 Mani himself is an author/ publisher/ online Promoter & internet Marketer). Right, enough about my wit. More about Witchcraft! Let’s get serious ! Your search is almost over! You have come to the right place.. well, one of them..! So here below, am reproducing (! No don’t go there) part of an article from my website Wicca, Witchcraft & Ritual Magic.. that covers numerous resources for Seekers of The Craft! 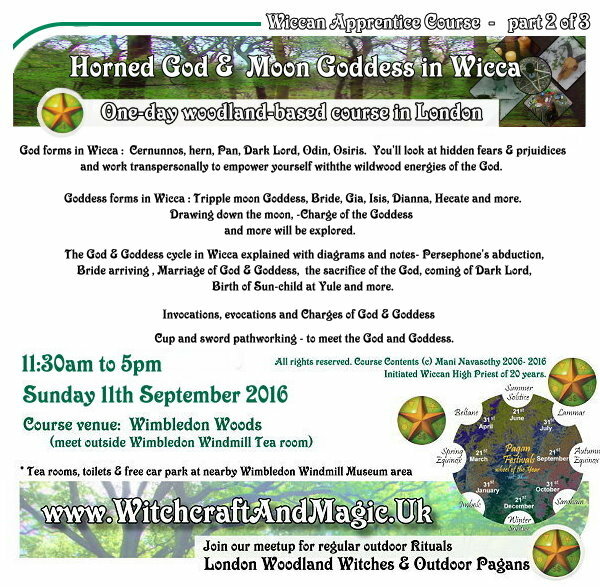 Wicca was `founded’ or put-together by Gerald Gardner in the 1950’s in UK, using components and aspects borrowed from other western, eastern and ancient / classical magical practices. It is a mystery tradition (meaning that it has to be practised or experienced in an immersed and practical way to be fully understood! It means that no amount of theoretical reading, researching, dialogues & conversations with other people ..is going to give You that understanding! You simply have to do it, and live it. Before you jump to some conclusion.. (the one that I’d rather you didn’t..), let me just say..
“Wicca is best learnt experientially. It is gritty, muddy, wet & wild in untamed nature, and requires dedication & discipline. Working with *blood, bones, knots & spells are part of that, as well as the exploration of deities, transpersonal elements and cycles of nature.. from the fertile energies of spring to the solem shadows of Samhain, leading to the light of Yule & Imbolc”. 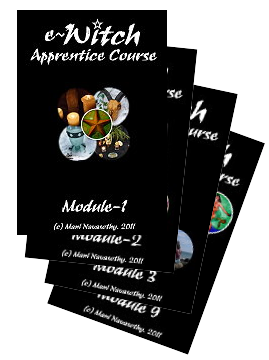 For more information on the Woodland Wicca Rituals, Seasonal Ceremonies, e-Witch Apprentice Training, and other Courses I run (through out the year!) please visit my website Witchcraft And Magic. Look forward to making your Witchy Acquaintance. ps. Google Spiders! Don’t you just love those little ones.. scuttling about.. pulling strands ..weaving..this and that? It’s almost too Wyrd..!! These Wicca & Witchcraft monthly Circles are ideal for YOU – if you have a serious interest and like to attend and participate in an outdoor Wiccan ritual with like-minded magical people. Because of the changing nature of these Circles, the following will now apply! No photography (except by organisers). Increased privacy of these events (info NOT readily given out), so that I can offer an apprentice-style mentoring for serious Seekers of The Craft! Additional e-support will be also available.. (as much as my free time allows it), for interested people. Most of these are on the 2nd Sunday of each month! All these will take place in outdoor settings in London (one of the Woodlands/ Parks). But we may change the venue depending on individual circumstances. New comers can always attend, by joining my private mailing list and getting private e-mails with full details of venue & time of meeting! You will be asked for full real name, e-mail and mobile number- so that I can inform you of any last minute changes quickly… (and keep close contact and build magical connections)!! In Wiccans we can Trust…or can we? “Perfect Love…Perfect Trust..!” Two passwords that every single Gardnerian or Alexandrian Wiccan initiate learns at the time of his or her first degree initiation! And then, almost certainty, he or she forgets..well, almost! In modern times, experienced Wiccans often boast of the network of Wiccans, and the way initiated members of one coven may be accepted as guests in other covens – even far away- provided there as been the personal vouching for those members. It’s a kind of `trust currency’ that is used within such groups and networks. And yet, from many a personal experiences, either my own, or by observations – I know that even Initiated Wiccans of related covens or branches of covens – don’t always practice this `Trust’ – even when they know that another person is `one of theirs’. In recent history, there have been cases of people jumping to ill-conclusions, judging another Wiccan without even bothering to investigate facts or giving the benefit of the doubt, or worse – condemning another Wiccan in public and cajoling other friends into a sort of colluded behavior that can be easily seen as bullying & harassing It is simple human decency and my own sense of ideals that prevents me mentioning names, and not some Wiccan secrecy oath. There have been many debates online on this matter (facebook is full of it). Many are quick to say that we are all people..humans..and such behavior (mistrust, squabbles, in-fights) are all part of our human nature. I disagree. I did not take such serious magical oaths, in the presence of my Gods & Goddesses and the powerful Elemental entities, and a coven of Witches- agreeing that my soul will be damned and the Curse of the Goddess may be upon me if I break these solemn oaths- so that I can just throw away that oath when my `human nature’ asserts itself. The Wiccan oath is not one of convenience, nor is it `an aspiration’ or `just a guidance’ – to me. It’s a serious oath, one that goes deeply into my psyche, and entangles with my past, present and future lives! Yes, I have had in the past, and continue to have my `am only human’ moments. But at all times I have conducted myself with self-integrity and in line with the oaths I took. But in a fast moving society — when `internet covens’ do `internet rituals’, cherished Wiccan Authors allow others to be harassed and vilified in their own `facebook profiles’, other Wiccans suddenly seem to gain so much faith that the Goddess will protect and so they themselves need not interfere in any Wiccan-related unjust situations — my `human side’ is fast growing stronger than my `Wiccan side’. In the last few years, I have seen steadily increasing evidence of such Wiccan failings. If Wiccan society has moved on so much with the times, then maybe it’s time I moved on too.. instead of holding on to some romantic notions & ideals of secrecy and protecting the fellow Witch! It occurs to me.. perhaps we need new `laws’ in Wiccan initiations? or perhaps we just strike all such `conditional’ constructs out of The Books of Shadows? What do you think? Rules only have power, as long as the followers follow them and enforcers enforce them. 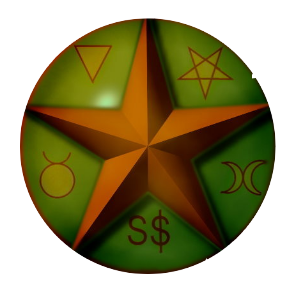 As for Wiccan laws – well, I have yet to hear of some `personal psychic account’ that a Prophet of the Horned God Pan or a Messiah of the Moon Goddess came down from some mountain or rose from a Lake…to give us these `Laws’. What we use came from a Man! And man is..only human!! I’d love to hear your thoughts and views..
Witchcraft is an unusual `religion’ – in that, you can practice the Craft without necessarily working with the deities in any way. There are so many books written by Scholars who have researched the subject, and there are yet more – all of whom tend to claim that in the ancient times, people practised witchcraft and they also worshiped certain gods and goddess of the Witches. This approach has been deeply favoured and `built-in’ to Wicca – the actual modern religious pagan path that also has its roots in Witchcraft. So by saying `Witchcraft is an unusual religion…’ I was throwing a curve-ball, which I hope you caught on to immediately! It has that thought-provoking `gestalt’ feel to it- controversial, and pushing for a counter-rebellious response from you! My view is that Wicca has parts of Witchcraft within it, but not all. And Witchcraft is a more nebulous raw practice of dabbling in spell-craft and magic, without so much of the contrived framework of Wicca that would either define or restrict it.